What does 2019 hold for journalism? Kristy Roschke rounds up 15 insightful NiemanLab predictions in misinformation, engagement, transparency and research. 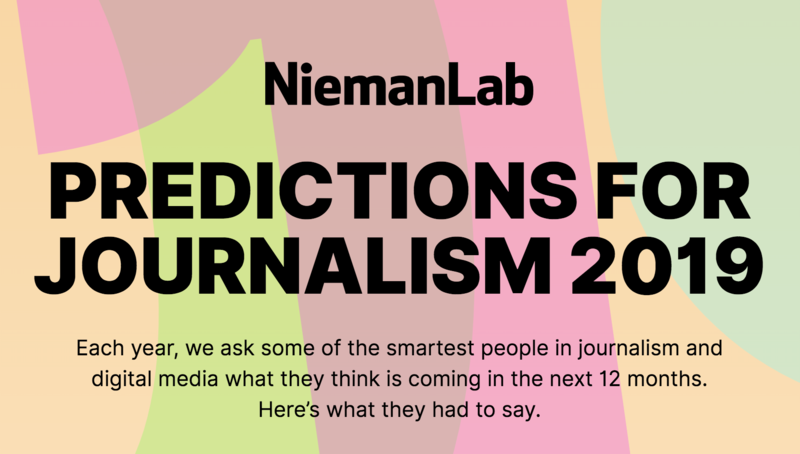 Each year, NiemanLab gives its readers the gift of new year’s predictions — a gift that keeps getting bigger, and topped out at 200(!) journalism-related predictions for 2019. This year’s lengthy list is full of insight from so many people whose work I admire, and what I’ve read has given me plenty food for thought about the future of journalism. It may take me the better part of the year to get through the entire list, so I started with those most relevant to the News Co/Lab’s work related to media/news literacy and misinformation. Here are my thoughts on what I’ve learned so far. The Intercept’s Rubina Madan Fillion warns of the dangers of deepfakes to continue to erode audience trust. I particularly like her suggestion that, as news organizations train themselves to become experts at spotting deepfakes and verifying digital artifacts, they should also be transparent about their methods so their audiences develop a better understanding of what we’re up against. 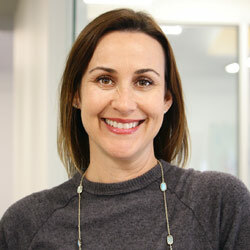 Rather than being worried over the hype over deepfakes, however, First Draft’s Claire Wardle suggests the bigger concern is the “drip, drip, drip of … divisive hyperpartisan memes on society.” She notes that much of the mis/disinformation being shared ahead of worldwide elections has taken the form of “emotive, disproportionately visual messages” on platforms like WhatsApp, SnapChat and Instagram, and that we are more likely to be susceptible to them than other forms of misinformation. Because it’s very difficult, if not impossible, to fact-check most memes, and because they are often shared in closed groups, this will make misinformation harder to track in 2019. First Draft is growing its team to work with partners to combat misinformation in these spaces in a number of countries holding elections this year. Meedan’s An Xiao Mina proposes two essential questions in the fight against misinformation: When and how do people believe things? And how can journalists work with a change in the dynamics of trust? We have shifted to a society marked by “digital dissensus” and the continued waning trust in institutions. Mina argues it’s not the death of truth we are dealing with, but rather the death of consensus. As such, she suggests that journalists must acknowledge and adapt to a networked world in which authenticity and affiliation may resonate with audience more than authority. Digital Polarization Initiative’s Mike Caulfield rejects the notion that media literacy efforts can’t work because ultimately people believe what they want to believe. On the contrary, Caulfield’s work with students has shown that tribalism does not present much of an issue when students are taught basic verification skills. He argues that “many forms of both radicalization and infiltration [via YouTube and other digital platforms] would be more difficult with a media literate audience…” Importantly, Caulfield suggests that teaching basic vetting skills to digital influencers can have an outsize effect on those whose who follow them. I’ve seen firsthand how fruitful discussions around media and information literacy can be, having taught high school journalism and an undergrad digital media literacy class for many years. My observations are anecdotal, so I’m following with great interest results from Caulfield’s information literacy pilot project. Craig Newmark predicts — and I hope he’s right — news organizations will implement new reporting methods that will keep from them from being “loudspeakers for liars” (a phrase used by News Co/Lab co-founder Dan Gillmor). I especially like the idea of news organizations and social media platforms considering disinformation a breach of terms of service, with repeat offenders being banned from coverage because they do more harm than good. Lauren Katz of Vox predicts that “[b]uilding connections between reporters and audiences before, during, and after the reporting process will benefit journalism in the long run, and that realization will become a focus throughout newsrooms next year.” Building and connecting with community has been a focal point of the News Co/Lab’s work with McClatchy newsrooms in Fresno, Kansas City and Macon, Georgia, this past year, and we have seen early benefits in our projects with partners like Hearken, Spaceship Media and Report for America. In 2019, we will continue to dig deeper into what the community wants and needs, and what are the appropriate measures of success for community building efforts. A culture of experimentation is necessary in order to make newsroom changes that have positive community benefits. Michael Grant, co-founder of the Survival Kit for Journalists of Color and UX design editor at Reveal for The Center for Investigative Reporting, encourages newsrooms to experiment in small but well-designed ways as a means to develop “new habits of achievement” (which I think is an incredible phrase I intend to use often). The folks at Hearken predict a “pivot to people” in which journalists invest in people’s community information needs and truly approach their process as a community service. They advocate for an editorial CRM (customer relationship management) system that prioritizes meaningful relationships with the audience. Lastly, they predict more newsrooms and libraries will “have babies.” The News Co/Lab has helped populate this new world by bringing together the Kansas City Star and Kansas City Public Libraries for a Hearken-based project that not only answers residents’ questions about their city, but also shows them how they got the answers. This last piece is unique among Hearken projects, but we believe it is a critical component to helping readers better understand how to locate and analyze credible information sources. Voice of America’s Salem Solomon predicts artificial intelligence will aid better verification and correcting mistakes in a meaningful and visible way. A renewed focus on processes that help avoid mistakes in the first place is a worthy goal, but I would love to see more news organizations own corrections as a powerful fact-checking tool. I understand why journalists (or anyone, for that matter) cringe at the thought of broadcasting their mistakes. But in order to move on from the current climate in which any mistake — big or small — can be held up as proof that the media is all “fake news,” I think we need to humanize corrections by explaining how and why and in what context a mistake was made and what was done to fix it, something the News Co/Lab is working on with the Kansas City Star. “Iterative journalism” — I like this phrase that the Wall Street Journal’s Francesco Marconi uses to describe the evolution of community involvement in the news process. By going beyond typical audience metrics gathered when a story is viewed, iterative journalism fosters communication between journalists and community members to help identify needs and shape coverage to meet community needs. Patrick Butler, vice president of the International Center for Journalists, points to McClatchy’s #ReadLocal campaign as an example of how news organizations can better illustrate their impact on their communities. He argues that news organizations can’t stop at measuring the reach of their content. They must measure why their content matters. I agree that it’s necessary to get a mix of quantitative and qualitative measure for examining the impact of content, and the News Co/Lab is using both to evaluate our McClatchy newsroom partnerships. From a research perspective, Sue Robinson, Helen Firstbook Franklin professor of journalism at the University of Wisconsin, suggests we will more closely examine how we conceptualize audience engagement, and predicts “newer” definitions of engagement specialists will become the norm. When you’re steeped in the news, it can be easy to forget that a good portion of U.S. adults actively avoid it. Northwestern University Associate Professor Stephanie Edgerly suggests studying the news “un-audience” can be as important as the efforts we put into learning about the audience. This idea is particularly resonant to me as a former high school teacher. I have seen firsthand how disconnected teens can be from current events, and I am acutely aware that there is no magic point in time at which young people suddenly become engaged news consumers. This audience needs to be cultivated and, as we lose opportunities for conspicuous consumption of news with the decline of print media and family television viewing, it is imperative we learn why they don’t consume news and what could compel them to change their habits. The predictions I’ve highlighted are mostly aspirational, and I suppose that was (subconsciously?) purposeful. The ideas presented here largely take concerted effort at the local level, with the hope that they create a groundswell of change across the journalism industry. I’d like to think that 2019 is the year we start to see that happen.